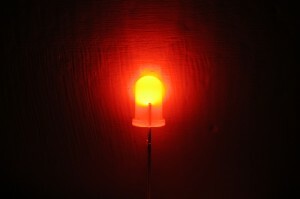 Standard red, yellow, and orange LEDs have forward voltages of 2.2v and require a resistor when powered by higher voltages such as 3V batteries. But these special LEDs are specifically designed to work with 3-3.2V batteries. They have an internal resistor so there is no need to add one yourself. Just wire it up to you project just like any other LED on this page. Perfect for your LED hoop or any LED project when using a 3V battery. Strobe LEDs appear white when not moving, and leave color trails when in motion. Strobe Ribbon LEDs leave color trails that are connected without spaces between them. Strobe Dot LEDs leave color trails that have spaced of darkness between them and they look like dots. The LEDs have only 2 legs and connect just like standard LEDs. These are 7 Color RGB Ribbon LEDs. They appear white when not moving, and leave color trails when in motion. They are “Ribbon” LEDs because the colors trails are connected without spaces between them. These can also be referred to as dragonfly LEDs. These LEDs have only 2 legs and connect just like standard LEDs. Current draw: 20mA / 40mA max. They appear white when not moving, and leave color trails when in motion. They are “Ribbon” LEDs because the colors trails are connected without spaces between them. They appear white when not moving, and leave color trails when in motion. They are “Dot” LEDs because the colors trails have dark spaces between the colors making the trail appear dotted. These LEDs automatically and slowly cycle through the colors: Red, Green, Blue, yellow, teal, purple, white. Please note that these LED are not synchronized with each other. They each change at a slightly different rate. If you need synchronized LEDs you can show your interest by contacting me so i can develop the new kit. These LEDs cycle quickly through all colors. **Note** These LEDs also cause other static LEDs to flicker a little as well. This effect is less noticeable if using the rechargeable battery upgrade. These Turquoise are similar to our Aqua Greens that were discontinued. UV LEDs makes a nice deep purple (hard to see in the photo) and makes white objects pop with a glow. The UV LEDs are about 3x the cost of others, so 7 for $12 is a bargain. Please note that UV is generally hard for the human eye to see. The photos above were taken in complete darkness, they may appear less bright in person. If you want to achieve that black light effect I recommend at least 21 UV leds in a hoop. NOTE: UV requires more voltage than the other LEDs on this site. They work with all battery systems on this site, but some battery systems are better than others. The rechargeable battery pack on this site offers decent UV brightness. The AA module kit powered by a 1.5V alkaline also works ok. The AA module kit powered by a 1.2V NiMh is a bit dim. The disposable 3.6V lithium battery is a bit dim. For maximum brightness with UV you can combine the rechargeable battery on this site with the AA module circuit. Or use 2 AA batteries with your AA module kit if you find space for it. Switch pre-wired option - If you really want to avoid soldering in your LED hoop you can buy the switches below with wires already attached. 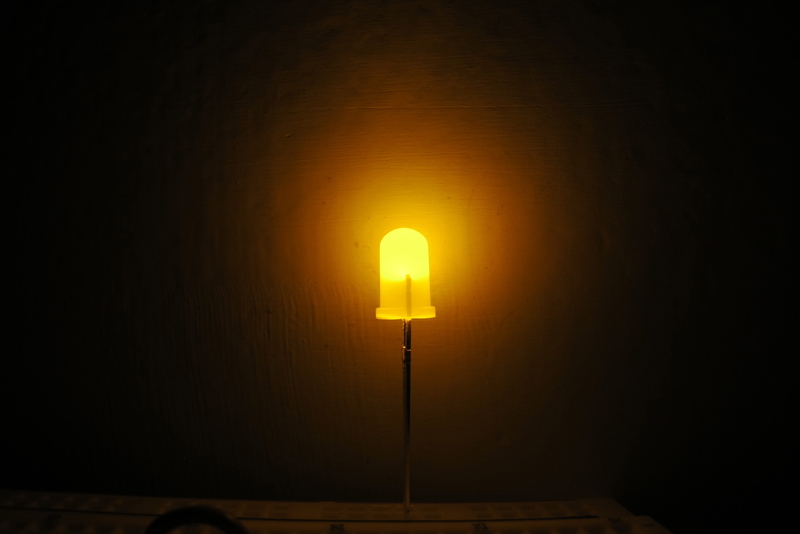 Now you just strip the ends and twist them onto your LED circuit, cover with tape and you are all set! Making your own LED hoop could not be easier. This is especially useful when using small slide switches. See size options below. Hi I was planning on ordering some of your slow change leds but I needed to know what the voltage and forward current are so I can order the proper resistor. If you do not know but can tell me where you get the slow change leds from that works too because I can go and look up the specs. The Slow color changing LEDs have a forward voltage of 3.5 to 3.8Vdc and a forward current rating of 20mA. But if you are placing them into an LED hoop like the one I have on my site with the batteries I supply you should not have to use a resistor since the battery voltage is less than the LED voltage. So if I order extra LED’s for my hula hoop can I just add extra, as many as I want? or do I need something else to in order to do that? To give you the best answer I just performed a quick test. I took a standard string of 21 LEDs from the kit and attached it to the standard non-rechargeable lithium battery. I then connected a second string of 21 LEDs to it. All 42 LEDs light up very well. I could tell that the first string got just a bit dimmer when I made the second connection. But generally still very bright. Its barely noticeable. Then I repeated that test using the rechargeable battery. This time all the LEDs were very brightly lit and the first string didnt waver one bit. So I would anticipate you can put more than 42 LEDs on the rechargeable version. I dont know what the max would be. So I would say you can definitely add 42 LEDs to your hoop with either battery, possibly more. The only major impact on performance is your battery life. I would estimate that 42 LEDs drain the battery twice as fast as 21 LEDs. What voltage of resistors do you need, what determines what resistor you need? If I have the rechargeble battery and red LEd’s what type of resistor do I need? (Battery voltage – LED Forward Voltage) / 0.020A = Resistor Value. These are just estimates, the LED voltage is usually in a range so some are 2V others can be 2.5V etc. But if you use 47, 50, 52, or 55 ohms you should be ok.
http://c3.ac-images.myspacecdn.com/images02/47/l_54eb158b5d95499e9566fc11bb5fc85e.jpg) and I really would like to get some of these lights but I don’t know what kind they are. I don’t think they’re normal LED lights, but I can’t figure it out. Thank you! Megan, this looks like a hoop made by PSIhoops. I am not certain but I think the dashed light trails you see are created by the rapidly pulsed LEDs. I dont know of LEDs that would do this on their own, so I think you need a bit of electronics to get this effect. You can try the fast color changing LEDs I offer but I dont think it will look the same. If I create the required electronics I will post it on my site. I bought an LED hoop with 24 fast changing LEDs last year. It looks OK, but compared to the more expensive PSI LED hoops, mine looks very dull and dark whereas the PSI ones seem to glow a beautifully bright white/blue/UV purple colour. This is very, very apparent even when the hoops are not being hooped with – when they are standing still. I don’t think this is to do with the speed of the flash because the bright lights don’t appear to flash. I am not so concerned about the trails effect, although I would think that the brighter light would make the trails more prominent – I just want it to be a lot brighter so that it stands out in a positive way like the others. At the moment, my hoop really stands out in a negative way when I perform with my group! I don’t want to have to buy another one because although mine wasn’t as expensive as the PSI hoops – it wasn’t that far off! What can I add to my existing hoop to make it brighter and better?! where did you get this hoop from? i’m guessing its not with prodmod parts since we usually use 21 not 24. I’d have to know what type of LEDs are inside before i can say if the fast leds i sell here would be better. in general you can try giving it more power as long as you dont give it too much. But again, I’d have to know more about how the hoop was made before I can give you some constructive advice. I got it from superhooper – perhaps it is 21 LEDs, but I thought that it was 24! It is the SuperStar model if that helps? I am also finding that the piping is very wide and very stiff, so much so that it has grazed my back in a number of places! It also makes a very, very loud rattling/clattering sound! I think that I may need to go back to the drawing board with my hoop, perhaps keeping the original LEDs and then adding new ones to improve the brightness and adding a rechargable battery. How about the purple LEDs that are mentioned on this site – will they give it that bright almost UV glow? How would it look if I put fast and slow changing lights with the UV lights? Or do I need to have more stable colors, what effect do the stable colors have? Thanks! Hey! I’m looking for the LED’s that look white while they are still but when you hoop with them, they turn red, green, and blue… do you sell those? if not, where can i buy them and what exactly are they called? I just submitted my order. I didn’t order any of the stable colored LEDs because I got anxious to order after my question, but if you think those are something I need please let me know. And I think what Lindsay is referring to above me are the super fast flicker LEDs? If you knew where to get those I would be forever grateful as well! alicia, you ordered fast, slow, and UV. The UV are steady lights. Its all a matter of taste. I think it will look good. Can you put both fast changing and slow changing LEDs on the same hoop? katina, yes you can combine any LEDs that I show on this LED page. I made my first prod mod hoop with the basic package-blue, green, and slow color changing, and it turned out really well. Now I want to try some different combos of LEDs. I’m looking for some of the super fast flicker LEDs like LED Heady Hoops uses. I want to mix those with some of your fast color changing LEDs. Do you know anything about those or where to find them? I’m also worried about using the wrong LEDs with the prodmod power source. Is there something I should be looking for? Or are most basic LEDs going to be ok? I ordered a standard kit from you and some extra LEDs from superbrightleds.com but am not sure what specs I should look for and whether or not I got LEDs I can use. My question is what does mcd mean and is that going to effect whether or not I need resistors for my strings? I should have researched this more. Thanks. mcd stands for millacandelas and its a measure of brightness. So that isnt an issue when connecting it to the ProdMod style wiring. You do have to look for their voltage rating. In order to avoid using resistors the Voltage rating should be around 3-4 volts. These are typically white, green, blue, UV. basically the colors on this page. But colors like red, orange, and yellow only require about 2-2.5V. if you use those colors you would need to use resistors. My daughter bought one of your kits with UV LEDs. Do you have a data sheet for those or at least know the forward voltage and current specs for those so I can set this up properly. I plan on pulsing the LEDs to conserve battery life and need to know the typical as well a max ratings for the LEDs. Thanks. The Vf is 3.2 to 3.6.
absolute max current is 30mA. Pulsing the LEDs will help with battery life and also make really cool dotted trails. The UV LEDs will light up other uv reactive colors too right. might be a dumb question, just wondering. I ordered UV, fast, and slow flicker LEDs but I also ordered RGB LEDs from another site. It says that the forward voltage is RGB: 2.0, 3.2, 3.2 V. Is there anything different I would have to use like a resistor since the LED lights are mix of the 3 colors? Hey, I am looking into quite possibly buying a large quantity of LED’s for hoops on this page… but I REALLY have my heart on having some pink in my hoop as well! I have seen pink ones in the store, but am not sure what type would be compatible with the LED’s I buy here! I’m a *total* newbie to LED wiring. Is this the best site for basic tutorials on getting familiar with LEDs & the wiring of them (including figuring out how much battery power / voltage is needed & also what resistors are and how to figure out which ones to buy)? If not, can anyone recommend a site or book? Is there any problem with combining the slow and fast LEDs if using the rechargeable battery kit? some have reported that the FAST change LEDs cause the other LEDs to flicker. But this is less noticeable when combined with the slow changing LEDs. Also out of all the power systems available on this site, the rechargeable battery system would be the best. Got a question about a hoop I made…sold it to a lady that let the rechargeable battery totally drain out. She can get the LEDs to light only with the charger in the wall. Did she effectively kill the battery? I assume I can re-do the battery pack so my question is do you sell just the battery or will it come with another charger? One more question about combining the slow and fast LEDs (with the use of the rechargeable battery pack) is there any issue with the “life-expectancy” of the battery or LEDs, knowing that flickering can occur? The flickering shouldnt cause any damage to the battery, and definitely not to the LED since they are designed to flicker, they have their own chip built into each LED. I will add the option to buy only the battery on this site shortly. i would very much light to get some red, orange, and yellow lights…can i order them through you guys???? We now offer red yellow and orange LEDs with built in resistors so you can use them with your prodmod hoop just like any other LED on our site. I just want to say how incredibly HAPPY I am with the combo of the slow and fast LEDs. I have made some awesome hoops as of late–THANKS PRODMOD- these babies are GORGEOUS!! first off – i used your kit and made a hoop that is rechargable. it came out very well. now I have others that want me to make them some hoops, but the cost of the rechargable puts the price at around $80. now from what i have found out the led lights are very well priced here and the wire you use is pretty generic and can’t cost much, but the battery and adapter is where the biggest cost is. is there some way of bringing that cost down? some of the folks that want these are kids, and the others don’t have much money. I am not going to make any money out of this, just doing it to help others. Question about the white LEDs. I recently saw a hoop that was all super bright white LEDs. They were waaaay brighter than any other LEDs around. Are these white LEDs super bright like that, or are they basically the same as the other LEDs you have? I’m not sure if the lights I saw were something special or what. They might be high powered LEDs, they are brighter, use more power and a little more expensive. 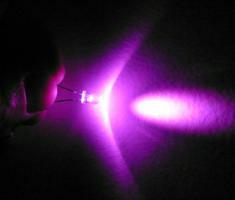 Look for LEDs that draw at least 50mA or 100mA. What is the size of the LED lights? 5 mm? I think that i want to use resistors for my hoop. do you know what the “voltage drop across LED’s” and “desired led current” (from the calculator that you provided) should be for the fast color changing, uv, and standard blue led lights?? Also, approximately what kind of wait can one expect for delivery of kits ordered? Could you list the mcd ratings for all your LED’s? I’m looking to try a variety of colors and I’d hate buy LED’s from someone else and have them outshine or be too dim in comparison. What is the view angle on your LED’s? How large an angle is necessary for it to look good in the hoop? please keep in mind that these mcd ratings are average and what my vendor reports. Its really hard to say whether they are accurate or not. There is a range for each LED. Sometimes it can be plus or minus 20% of the average. I try to use wide angle 100 degree LEDs whenever I can, but some LEDs like the Aqua Green are 45degree, and the Pink is 25 degree and they still look good in the hoop. You can also wrap the LEDs with tissue paper if you want to hide harsh edges, but you lose a little of the brightness. I’ve been looking at purchasing one of your hoop kits for a while, but I’m having a hard time deciding what color LEDs to buy. Now that you have the strobe ribbons, I’m leaning toward those, but I don’t know what other colors would look best with them. Any suggestions? 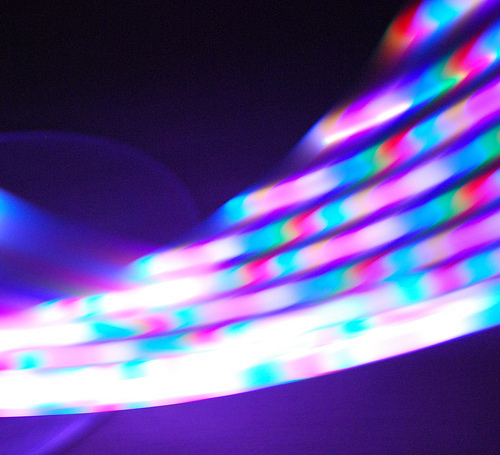 Do you think a hoop w/ all strobe ribbons would be too overwhelming to look at for a while? the ribbon strobes currently on sale do have a slight flicker to them. Some notice it more than others. So if you are sensitive to that then having the entire hoop made with these LEDs might be overwhelming. In that case you can use 7 strobe LEDs along with other colors. Almost any color will do since the strobes are multicolored themselves. I would just avoid UV since they take more power than the others. But in general if you want the cool effect of the strobe LEDs then 21 strobes are the way to go. I think I am gonna go w/ all strobes! Are there just 21 in hoop in the video you have posted above? I am having trouble with a 21 LED hoop. 7 blue, 7 green 7 STROBE RIBBON LEDS. The blue LEDs keep burning out. Any suggestions? Terry, based on our discussion off-site it turns out you are not using a battery from prodmod, instead you are using a 3.7v Li-Ion battery. Those have higher voltages and its possible you are pushing too much current through the blue LEDs. It is also possible that you have a problem with your circuit connections. i was wondering if you had any video of the each of the 3 color ribbon leds your selling. I’m thinking of using them on some mini hoops but not sure how they are going to look. is it possible to make a 40′ hoop with 32 leds instead of 21? On a 93 in. Circumference hoop, what should the spacing be on the mult. color ribbon LEDs so they don’t overlay. Also what spacing between LEDs for the 3 color ribbon LEDs? Why don’t you sell bright red LEDs? we do now. They are designed for hoops and run on 3v. no resistor needed if you use the power supplies on this site. Hola i was wondering what the specs are for your solid white and pink leds? THANK YOU!!! I want to change the colors of the LEDS in my current hoop. The tubing diameter is 1/2 inch and the hoop runs on 3 AAA Ni mH batteries. 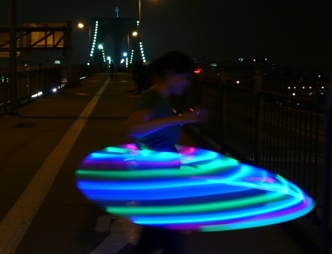 Giving the hoop a 3.6v voltage with 3 aaa batteries combined I wanted to use your LEDS to make a 21 led Rainbow hula hoop. using 4 red, 4 orange, 4yellow, 3 green, 3 blue, 3 violet leds. My question is would I need resistors??? or could I just interchange the old LEDS with the new ones? woah! Hi Amanda, All the LEDs on this page are designed to work with 3V – 3.6V without the need of a resistor. So go ahead and exchange away! I know the red, orange, and yellows are rated up to 3.2V, but when you connect to a 3.6V battery you rarely get all 3.6V under load. Instead the battery voltage drops a bit. Even so, running the LEDs a little harder wont blow them, it will just consume a little more current, make them a little brighter, and reduce their over all life span slightly. Do I have to connect exactly 21 leds to 3.6v? Or could I connect like 6 or 7 leds to 3.6v? Would that make it stay lit longer or make the leds brighter? also I really like the pink/ white/ green leds on your page but the max voltage is 4.5v. Could I use them on a 3.6v? I brought some of the yellow LEDs 3-3.2v and they won’t light up? When I test 1 yellow led, it lights up orangish red with very little brightness. When I hooked them up in a series two or four, just to test them. They wont light up at all. What am I doing wrong? do I need resistors? I’m using the battery from the rechargeable kit. It may be your terminology, but these LEDs are intended to be hooked up in parallel not series. Check out my Make section for more details. As a test today i placed 7 of these LEDs in parallel powered by one 3.2v battery and they all lit up. So there are a few things for you to check. #0. be sure the LEDs are in parralel. This means the positive legs of each LED are connected. and the negative legs of each LED are connected. #1. The rechargeable battery supplied in your kit is not fully charged. This is done for safety. So if you havent charged it yet you should. if the above has not helped, please let me know. Hi, I want to make a hoop with 4 pink, 4 green, 4 aqua, 4 blue, and 4 UV. Would this require resistors? Also how many batteries do you suggest; I know there needs to be more than one for balance. I would like to use a rechargeable battery, which do you recommend? I’ll be using 1/2 inch polypro tubing. Thanks! Hi Abbey, all of the LEDs on this site can be used with the batteries I sell without the need of resistors. In our design we dont recommend placing more than one battery in the hoop because it adds too much complexity and will take a long time to repair if something goes wrong. Instead we use one light weight battery near the connector. Most people dont notice the imbalance. But if you want you can always add a dead alkaline battery to your wire at 3 equal distance locations before feeding the wire into your hoop. As for the battery size, the smallest I offer is the small rechargeable battery. Its diameter is about 0.620″ and it can tightly fit into any tubing with an inner diameter of at least 0.600″. So when you say 1/2 in poly pro.. it sound like the battery will be too large. But check the specs of the tubing from the vendor you are purchasing from and confirm the inner diameter. How long is the 7 COLOR STROBE RIBBON? 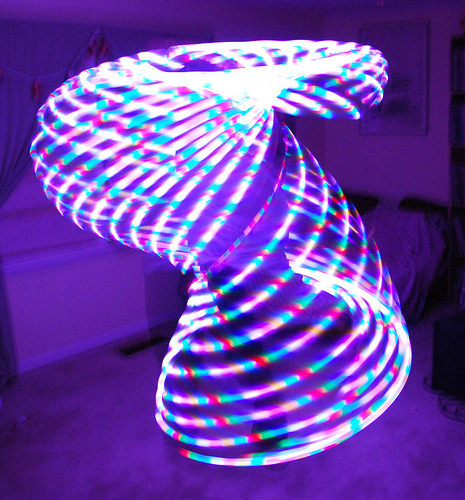 I want to make a hoop that has a 36 diameter and I need to know how many LED ribbons I need to purchase for it. If I order something today, when will I receive it. Best question for me to ask is, is this site still active? I just want to make sure it works before I order. Yes still active. Orders ship within about 5 days. If you are in the states the transit time is about 2 more days. I recently purchase a colour changing led hoop. The LEDs were in synch with each other creating patterns that repeated after a couple of minutes. The programming seems to have gone wrong now tho as some of the lights don’t come on when supposed to and sometimes they all stay on one colour. Since we dont sell completed hoops on this site I assume you purchased this hoop from someone else. You should ask them what the issue might be. Its hard for me to help if I dont know how they made your hoop. If the hoop was made with our Slow Color changing LEDs, they are not intended to remain in sync, they are controlled individually. Great internet websitewebsite! It looks really professional! Keep up the good work! I view it that is good written, easy to comprehend. I congratulate you because of this article that I’ll tell to prospects around. I request you to recommend the gpa-calculator.co page where each scholar or learner can find ratings grade point average levels.